Do you know your status? No, we are not asking about Facebook. We are talking about your Human Immunodeficiency Virus (HIV) status. The Chicagoland National HIV Testing Collaborative launched the Step Up, Get Tested campaign at the James R. Thompson Center in downtown Chicago earlier this month and according to the Illinois Department of Public Health, Illinois ranks seventh in diagnosis of HIV and in 2011, over 1,700 new cases of HIV/AIDS were diagnosed in Illinois. “Today HIV testing has progressed and become a lot less invasive making it easier for people to learn their status. With products such as Clearview, OraQuick, and Insti rapid HIV tests, we are able to provide a free, easy and quick experience,” said Anthony Galloway, chairperson of the Chicagoland National HIV Testing Collaborative. The Step Up, Get Tested campaign will extend through the first week of July, but testing can be done year round at multiple locations throughout Chicago. 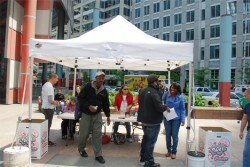 To get more information about HIV and the numerous testing sites, visit www.stepupgettested.com. Ricardo Jimenez, director of Vida/SIDA Health Center said he was happy to partner with the Collaborative to help reach out to the Latino community through the Step Up, Get Tested campaign. In the 80s, Jimenez recalls seeing many closed casket funerals and unannounced funerals in the Latino community, which he believes were due to the stigma created by the epidemic of HIV. “HIV was never talked about in the Latino community. Therefore, a group of volunteers opened a prevention and education services for people who were affected by HIV. We also wanted to teach the community that we have to treat these people humanely. We have to break the stereo type because the expression of sexuality is a human expression that should not to be judged,” said Jimenez. According to Jimenez, Latinos are the second largest group that is affected by HIV. “In the Puerto Rican community, it is a harsher reality because out of all the Latinas infected with HIV, 58 percent are Puerto Rican and over 50 percent of men infected with HIV are also Puerto Rican,” said Jimenez. Eliminating the stigma associated with HIV is one of the most difficult things to deal with in many communities, but Jimenez states that people need to know that HIV is not a death sentence and that it is important for people to know their status. “When someone comes in, they should have no fear, even if they are undocumented, the whole process is completely confidential. If they are HIV positive, we will link and take them to get the care that they need. If anybody has any questions, the can call our office and ask for me personally,” said Jimenez. If you’re interested in getting tested in the Humboldt Park area, you can visit VidaSIDA. They have English and Spanish speaking counselors available and walk-ins are accepted. This year, VidaSIDA will celebrate its 25 year anniversary as one of the leading Latino HIV prevention and education services in Chicago. “We are there to serve the community,” ended Jimenez.